The best mosquito trapper choices - Mosquito traps that work! In today’s article, we’ll be looking at the best mosquito trapper choices. Looking for a way to kill mosquitoes that’s friendlier to the environment and safe around kids and pets? Then a mosquito trap could be the perfect option. That’s because most traps require propane, a cleaner burning fuel that attracts mosquitoes without harmful poisons. However, these devices are no small investment. In fact, some of them can be downright pricey, but as long as you go into your purchase as an informed consumer, they’re worth the price to keep your backyard, camp or hunting cabin mosquito free. How do you find mosquito traps that work? 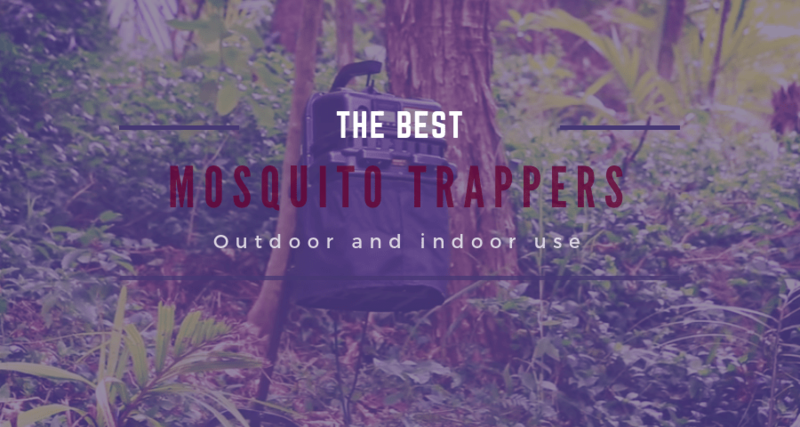 In this post, we’ll be reviewing the best mosquito trapper products in order to help you find an option that fits both your demands and your budget whether you’re looking for mosquito traps for indoors or outdoors. Let’s get started! What makes a good mosquito trap? Okay, so what exactly makes for a good mosquito trap? How do you make sure that you get mosquito traps that work instead of fancy lamps? The trick is making sure that you know how mosquito traps work. While you may think that all mosquito traps are the same, that’s not true. The best mosquito traps actually use attractants to up the catch rate. Cheaper traps generally don’t include these items, and that can give you less than satisfactory results. You’ll also want to make sure that you’re using the correct attractant. There’s different mosquito species to contend with and depending on where you live you’ll need either Lurex or Octenol. If you live in a northern state, then you’ll likely need the Octenol, but those in the south should probably go for the Lurex attractant for best results. Premium mosquito traps actually even allow you to dial in your methods to get better catch rates, and the extra features is what makes them so expensive. Okay, now that we know what you need, lets dive into our picks and explain why they’re tops for mosquito removal. The most popular choice for mosquito traps is obviously outdoor usage. Makes sense. That’s where the mosquitoes are right? Who makes the best outdoor mosquito traps though? Fear not hunters, campers and homeowners because we’re going to review the most popular options so you can choose which one is right for you in our mosquito traps review and buyer’s guide. Here’s our top picks for mosquito traps for outdoor usage. The Mega Catch is our top choice for mosquito traps, and it’s because when it comes to mosquito traps that work, this one just does. It’s one of the most effective options on the market, and it can be used with or without attractants, making it a prime choice. It actually uses several different methods to attract mosquitoes, part of what makes it so great. 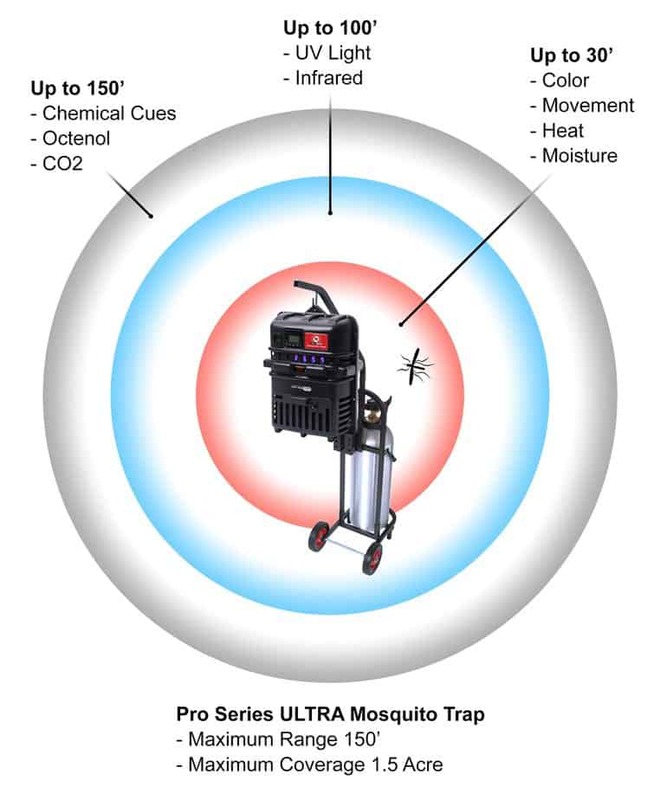 The machine utilizes chemical cues, Co2, color, movement, heat, moisture and more to make itself irresistible to mosquitoes and allow you to attract them over a wide range. This device has a huge number of features, and it allows you to dial in the trap in an almost overwhelming number of ways that allow you to catch even more biting bugs. That’s really important, because while you might think that a mosquito is just a mosquito, that’s not the case at all. There’s actually more than one species of mosquito and countless types of biting insects all over the United States, and by using a full featured trap like the Mega Catch you can be sure that your trap will be versatile enough to be effective no matter where you live. Cheaper traps are often lacking in these features, and you won’t be able to customize other options quite so well. While you might think that a device that’s so complicated might be a nightmare to fix, that’s actually not the case. In fact, Mega Catch’s machines are self serviceable, and they even encourage you to do so by providing on board diagnostics capabilities which is pretty cool. The only potential negative about the Mega Catch is that it’s not as portable as other mosquito traps are. This model requires you to have access to electricity at all times, and that’s pretty tough if you’re looking for a trap you can use at a primitive camp site. Best for? -This mosquito trap is best suited for those who need to keep their backyard or porch mosquito free. As long as you have access to a power source though, this is the best of the best in mosquito traps. Check the reviews here. While the Mosquito Magnet isn’t quite as full featured as the Mega Catch, it does have something else going for it. Two of the Mosquito Magnet’s models are actually cordless. Their LCD screen functions run off of batteries, and this actually makes them a better choice if you’re looking to use these devices in remote locations. 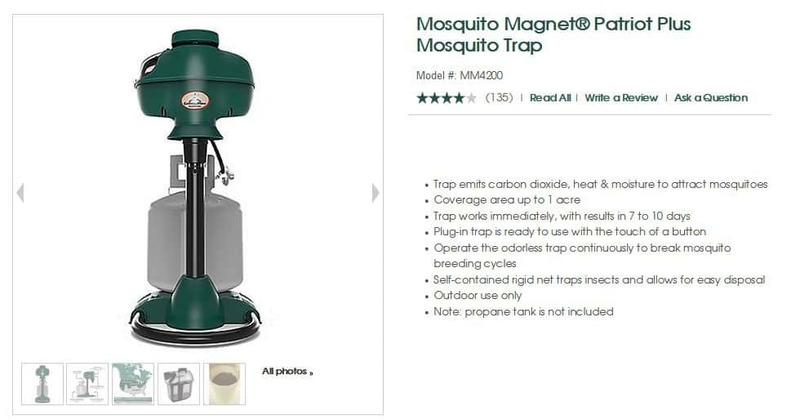 If you need to use your mosquito trap somewhere like a primitive cabin or campsite where your access to electricity is either limited or completely unavailable, then the Independence or Executive model of the Mosquito Magnet trap might be the way to go. This model is also a little bit more affordable than most of the Mega Catch models while still allowing you to have access to a lot of options. When using this trap you’ll be able to take advantage of either ocetonal or Lurex depending on your location, but other attractant options are more limited. However, this trap does not work without the attractant addition like the Mega Catch, so if you run out, your trap won’t work, so buy extras if you go this route. It does however feature a nifty fuel saving mode so you can make your propane last for your whole trip. Best for? – The premium models of the Mosquito Magnet are great for campers or hunters who might not have access to power at their location. These devices can actually run their functions on batteries, making them a more portable option and better for these occasions. Check the reviews here. 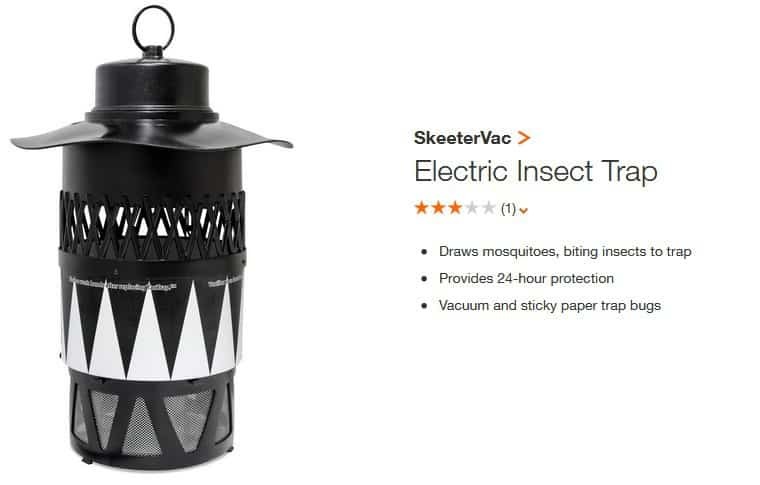 The SkeeterVac is a very bare bones style mosquito trap. Thanks to this, the unit is priced much more affordably than the other traps on our list, making it a prime budget option. That is if you’re okay with not having all of the bells and whistles that come with the other traps. You should keep in mind that this may come with a different level of performance. It won’t be possible to dial in the trap quite as accurately with its lack of features, and some consumers claim the SkeeterVac doesn’t work quite as well in the south as it does up north. However, it does have one very attractive feature. It functions entirely on propane. There’s no need to worry about having access to electricity or keeping up with batteries for this trap, because it’s self powered by propane. This potentially makes the SkeeterVac and attractive option if you plan to do a lot of primitive camping but want protection from mosquitoes. These traps are also relatively light compared to the other options too at around 19 pounds, and the larger model has a wheeled base to make lugging it around easier. If you’re looking for a more in depth look at all of these models, then we have a post for that as well that compares all of the features of the Mosquito Magnet, SkeeterVac, Mega Catch and all of their respective models so you can compare them. Best for? – Campers and hunters that are willing to dump some special features to save a little money. It’s a great cordless trap that can function using only propane. While this is less complicated and easy to set up, it’s also a little less effective without the attractants. Click here to see it. Okay, so far, all of the items on our list have used propane. What if you need mosquito traps for indoors though? You obviously don’t want to be using a propane based trap inside your home, camper or tent. That’s a big safety no no unless you like deadly carbon monoxide build up. Don’t worry though, because there’s some electric traps available as well which do a pretty good job in cleaning up any little buggers that manage to get in while the door to your cabin is open. These models do of course require electricity to run, and that means you won’t be able to use them in a primitive camping situation unfortunately, but if you are at a camp site with power access, then you might consider using one of these. The Alpha is the only Mega Catch model which is rated for indoor use. It uses only electric power to run, and that makes it safe to use it in your home. However, it can also be used outdoors if you’d prefer to use it over another model, and it’s effective up to a half acre. If your yard is small then you can easily plop this unit on your porch for your barbecue, take it with you for your RV vacation or stick it inside if too many skeeters manage to make it through the door before you can get it closed. This is one of the most effective of the indoor models of traps, and it’s also pretty affordable to boot, which is pretty nice. It’s superior to most other indoor traps, because you can actually use Mega Catch’s attractant strips with this model to up your catch rate, while others only try to use heat to attract biting bugs. Our trophy for best mosquito trap indoor goes to Mega Catch Alpha! Best for? – People who have access to electricity and need a trap that safe to use inside your house, cabin or RV. Works pretty well and comes with attractants, making it better than other traps which are really just glorified bug zappers. Check the reviews and features here. This great little pesticide free insect trap covers an area up to 1,000 square feet and it can attract a number of biting bugs. It utilizes heat, light and an interesting titanium dioxide coated surface which produces Co2, attracting mosquitoes. While it wouldn’t really be fair to try comparing this to one of the larger propane based models, this is a great device for what it does, and it’s likely one of the best options that you’ll find for indoor friendly electric traps. It’s compact, it’s easy to use and it works. However, it doesn’t have quite the range of the Mega Catch Alpha, and it’s not likely going to be able to keep your backyard or even your patio free of mosquitoes. This trap is more for catching the stray ones that get into your bedroom at night and drive you mad. Best for? 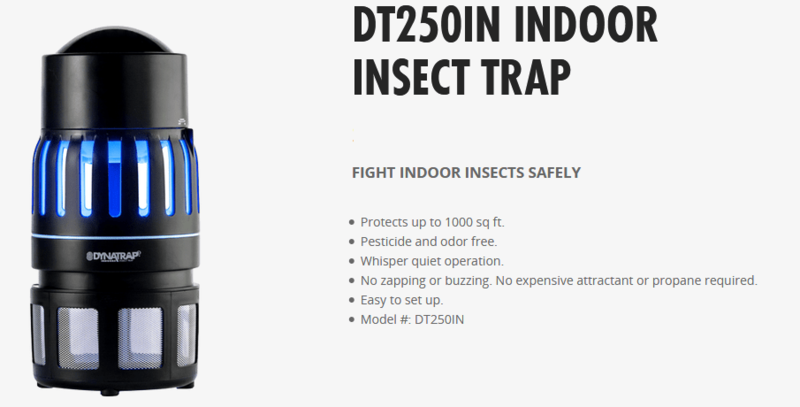 – Consumers on a budget who need an indoor friendly trap that can help kill mosquitoes in a small room of 1,000 feet or less. Not ideal for outdoor usage, but would be great for inside a camper. Check the reviews for this little trap here. 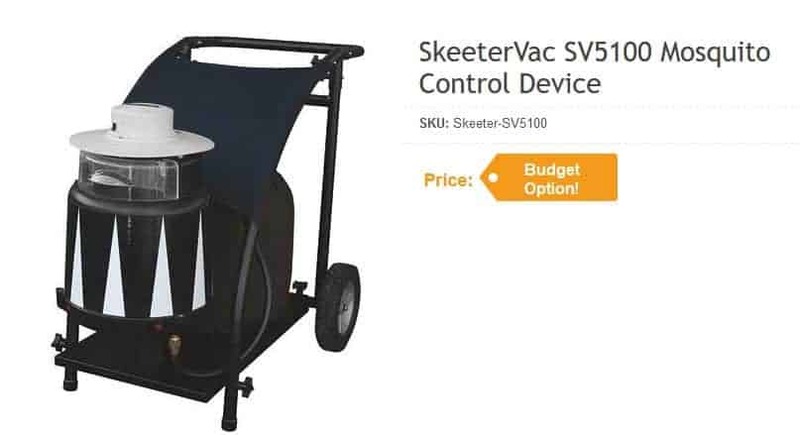 SkeeterVac also makes an electric model which you could use indoors. This unit has the benefit of being more affordable than the Mega Catch model, but it also could have a reduced catch rate unfortunately. Some consumers also find this model to be a little on the flimsy side compared to Mega Catch’s products. It doesn’t really have any benefits over the other traps except for price. It’s easily one of the most affordable mosquito traps on the market if price if your main concern. This trap will cover a half acre just like the Mega Catch Alpha will, and you’ll need an outlet to power it. No assembly is required, unlike with some of the bigger traps, and all you need to do is find a place to hang it up and you’re good to go. Best for? – People who need an electric trap that can be used indoors and want to save some money. However, this trap attracts using heat and light mostly which isn’t the most effective for mosquitoes. It can’t use any of the more advanced features of the other traps on the list, making the performance a little lacking. Check out the reviews for this trap here.